Just How Big Will Canelo-GGG Be? 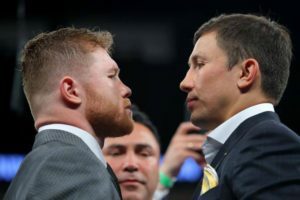 People were all kinds of excited when news was announced that Canelo Alvarez would finally be facing middleweight terror Gennady Golovkin in the ring. Not only was it THE fight serious boxing fans wanted to see, but the bout had the potential to cross the margins and make its way into the mainstream consciousness, where boxing rarely sees the light of day. There was a lot to look forward to that night in a Las Vegas ring, when Canelo, after easily beating Julio Caesar Chavez Jr, made it clear he and GGG would finally be getting it on. Boxing, much on the upswing in 2017, would have a bright shining object to show the world when middleweight supremacy was battled for in September. Unfortunately, another bright, shining object, nothing more than a trinket, really, seems to have taken all the mainstream potential Canelo-GGG may have promised. That particular object, which is honestly not worth mentioning, is said to be an affront to what is essentially the best bout in boxing. It may well be. But boxing fans shouldn’t care. For the truth is that Canelo and Golovkin were never going to break records when they met in Vegas. This was a one-to-two million buy pay per view event, at most. Enormous to be sure, but nowhere near groundbreaking. So don’t get too upset. Sure, the circus has pushed Canelo-GGG back to the margins. Yet it’s a pretty well-known fact that Canelo has an enormous Mexican fan base behind him that’s VERY interested in his bout with Golovkin. Let’s also not forget about the serious fight fans who won’t be wasting money on a circus but, rather, will be gladly coughing up money for Canelo-GGG. Here’s something else worth considering – boxing, with our without the circus everyone is talking about – is in a VERY good place. Canelo got good PPV numbers for beating a guy few expected to win last time out. Anthony Joshua beat Wladimir Klitschko in front of close to one hundred thousand people in London. The Keith Thurman-Danny Garcia battle owned the night when it appears on network television. Things are going strong. And as long as fights like Canelo-GGG are made, the sport will continue to prosper. A pop culture event can’t beat steady growth when it comes to the health of boxing. Circuses come and go. Great fights are timeless. Canelo-GGG will do excellent business in September. And if the fight is good, things will continue looking up for the sport.